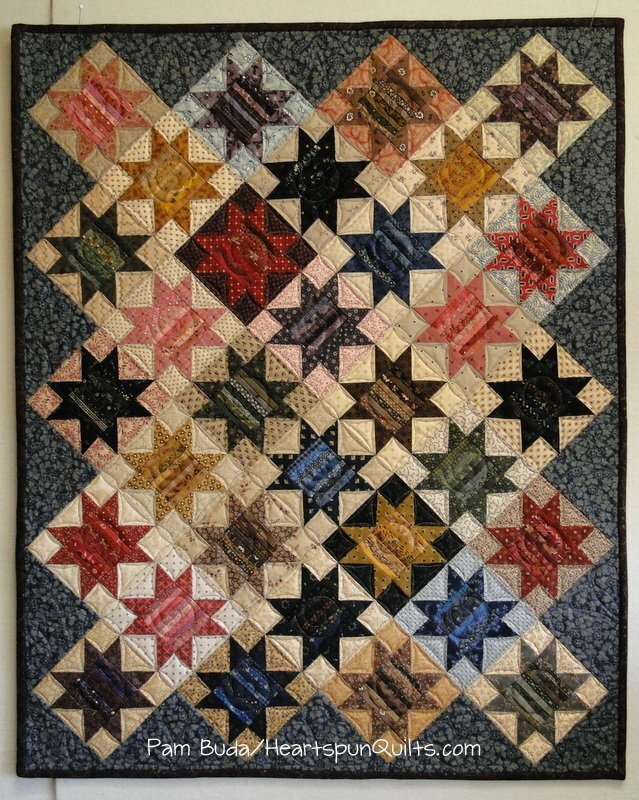 This quilt, which was originally featured in Primitive Quilts & Projects magazine, features a bunch of assorted Sawtooth Star blocks with fun paper pieced "string" centers. Made in an assortment of my favorite colors: red, blue, black, plum, green, brown, deep gold, and dusty pink, it's truly a great quilt for using up loads of different scraps! All of the paper pieced center strings are straight lines, which are the easiest of all to paper piece. This pattern also includes the additional instructions to take the star blocks one step further and make them into pincushions with paper pieced borders, using even more scraps! They are quite fun & addicting to make! Quilt size: 25" x 30" Pincushion size: 6"
If ordering outside of the U.S., please email me, and I will send you a PayPal invoice for the pattern and appropriate postage.